We met our newest Canadian friend Jay Calvert at the Weekend of Fire in Ohio, and he was packing – his Fuego Rojo and Fuego Azul sauces that is – from JakeAlberts.com. We had a chance to put these gourmet sauces to the test recently. First off, they come packaged in beautiful six-sided 8.8 oz (250ml) bottles with a simple front label logo. On the back of each bottle are suggested uses, and a link to JakeAlberts.com to find out more about the sauces and the company. Scott Roberts did a great job reviewing the Rojo and the Azul, both on ice cream, waffles, toast etc. 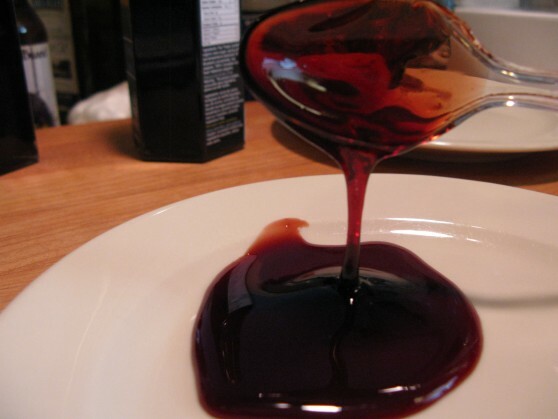 As these are Scovie Award Winning Dessert Sauces, Scott’s reviews were fitting and a great read. But we wanted to take them to the “glaze” level, brushing them on chicken parts and MOINK Balls (If you have to ask, click the link!) to get a taste of them on meat. First up is the Fuego Rojo. Brian: The Rojo is the thinner of the two sauces. To me it has a pourable pepper-jelly flavor. But this is not a sauce to be had straight out of the bottle. It needs to be brushed onto a meat for a last minute glaze. Marilyn: I see and taste a thin, honey flavored syrup – with some heat. I would try this in tea for a sweet, spicy brew. It is very sweet, with just a bit of heat. Nothing so hot as to call it a hot sauce. Brian: All I can say is the Rojo on the wings was just not strong enough to carry much flavor beyond a sweet, sticky glaze. However it did shine on the the MOINK balls. Those puppies were made for such a sweet spicy sticky glaze – maybe the fat in the bacon and the beef meatball really paired well with the Rojo, compared to the chicken wings. These were candied, slightly spicy and delicious. Marilyn: I agree – the Rojo sauce is just not strong enough to stand up to the seasoned wings. 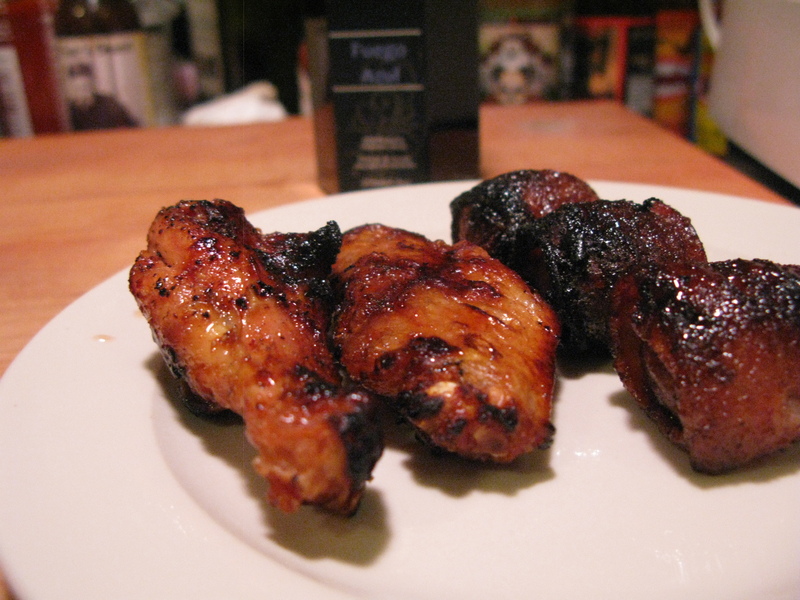 I like my wings with much more gusto – flavor, heat, thickness, etc. The MOINK balls were much better than the chicken. I first soaked the MOINK balls in the Rojo, but they were still a little sweet for me. My favorite result came when I took the MOINK balls for a quick dip, then let them set on a plate to soak up the goodness, leaving a bare coating on the outside, but lots of flavor infused. These was my favorite use of the Rojo on meat… a little sweet, a nice heat, and a great flavor throughout. Brian: Again, we had some wings that looked great! But the sauce, even though it was much thicker with a stronger overall flavor, just was not what I like on my wings. As for the MOINK balls, this thicker Azul sauce was much better than the Rojo. It was thicker, sticker, and I think much stronger in flavor, both from the blueberry and the heat of the habenero. My favorite of the two sauces here. Marilyn: I’m sorry, but blueberry does not belong on my wings. Yes, it was thicker and had more body than the Rojo, but I liked the flavor of the pomegranate better. On the MOINK balls, again, my favorite flavor involved a quick dip, a few minutes sitting and soaking. Since I’m a huge fan of hot dogs with grape jelly (childhood favorite, sweet & savory), I’m trying this next on a grilled hot dog! The Azul has a much denser, thicker texture, but for grilling meats, my vote is for the Rojo with its pomegranate flavor profile as my favorite of the two sauces. Now for the Ice Cream Test! Finally, we can’t let these sauces go without trying them on ice cream in order to experience the dessert goodness that they have won the Scovies for. Bring on the Vanilla creaminess! Brian: I’m sorry, but I’m a purist. I like my hot sauces. I like my desserts. I don’t want the “twain to meet”. I’ve never been a fan of “dessert sauces” and this ice cream experiment reaffirms my preferences. (And I just started 5 sentences in a row with “I”… guess Reader’s Digest will pass me by once again!). 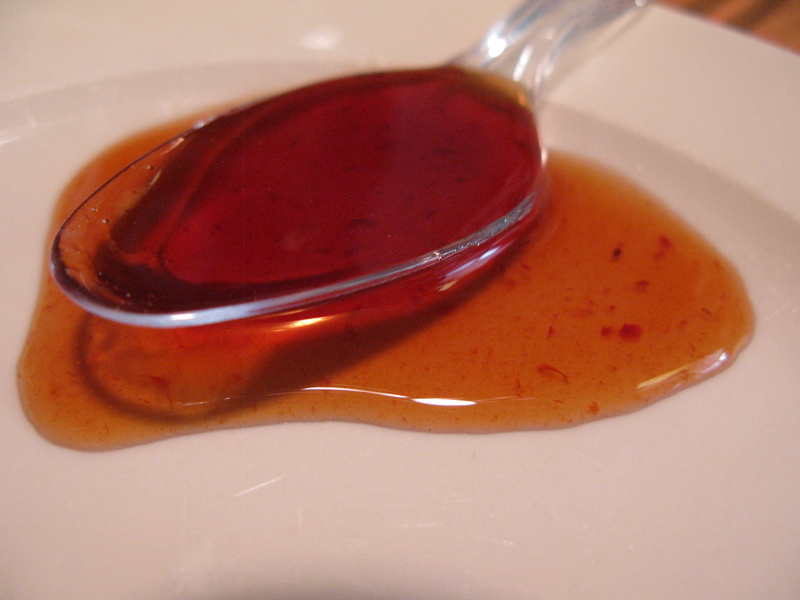 Back to the sauces on ice cream – there was a burn in the back of my throat while eating the ice cream. More pronounced with the Rojo, less so with the Azul. And I just don’t like the combination of a pepper burn with sweet foods. When it comes to dessert sauces poured on perfectly good sweet foods, I’m OUT! Marilyn: The Rojo is like a combination of strawberry syrup and caramel with a honey aftertaste. It’s very thin, and the heat stays a few minutes, but it’s not a killer heat. The Azul is very thick when cold – like King Syrup for your Easterners or honey for the rest of you. It definitely has a lot of blueberry, with a bit of heat that lingers in your mouth. But, I’m also not a fan of dessert sauces -although I do prefer the blueberry Azul on the ice cream over the Rojo, since I LOVE blueberry anything. Give me the Rojo soaked into meats, and the Azul for my desserts. Both are made with the freshest ingredients, so you won’t get any HFC’s here. Kudos to Jay for keeping his sauces honest and fresh! Keep in mind that these are indeed Gourmet Sauces with Gourmet Prices. At about $10 US per bottle and shipping from Canada at almost $10 each, these are for the true Gourmand or as a special gift to the husband/wife who just loves to try new, exotic sauces. We can recommend them as special gift packs or special occasion sauces to experiment with. Listen to our interview with Jay Calvert of JakeAlberts.com on our HotSauceWeekly.com podcast. Click the player below. I eat hot sauce. I cook BBQ. I write about both. Thank you for reading HotSauceDaily.com! That’s what I like about this site, unbiased reviews with good information. 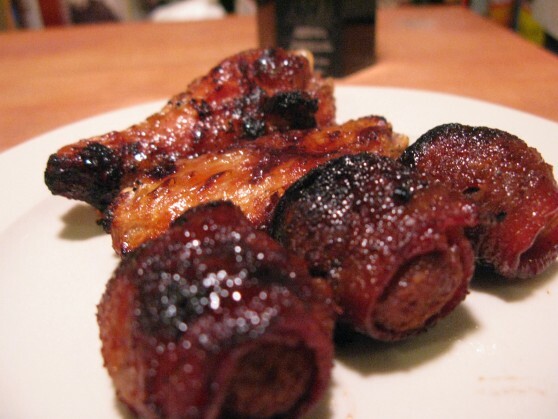 Taking the chicken and MOINK balls to the “glaze” level was the highlight of your photos for me. . .simply awesome. What a presentation! My mouth was watering after the first couple paragraphs. Thanks! Looks good and the bottle shape is different from the rest.